2013 is set to be a big year for the extended Vander-Cave family. I will hit the big 40 (shush, don't tell anyone!) and we have two family weddings and a baby due (sounds like the title of a film! ), all of which we are very excited about. Not so excited about being 40, that is more a grin and bear it event! I was asked by my niece if I would make her a wedding cake. To begin with I was blinded by panic as I am not a cake decorator and I do not have an artistic bone in my body. My Christmas cakes are very simply decorated to cover up for my lack of artistic flair. After a little time to get my head around it I started to get excited about the idea of cracking fondant work and royal icing piping. I even found myself offering to make the cake for my nephew and his beautiful bride to be. So last week it was my great niece's 3rd birthday and we were invited to her birthday tea at my sisters house. 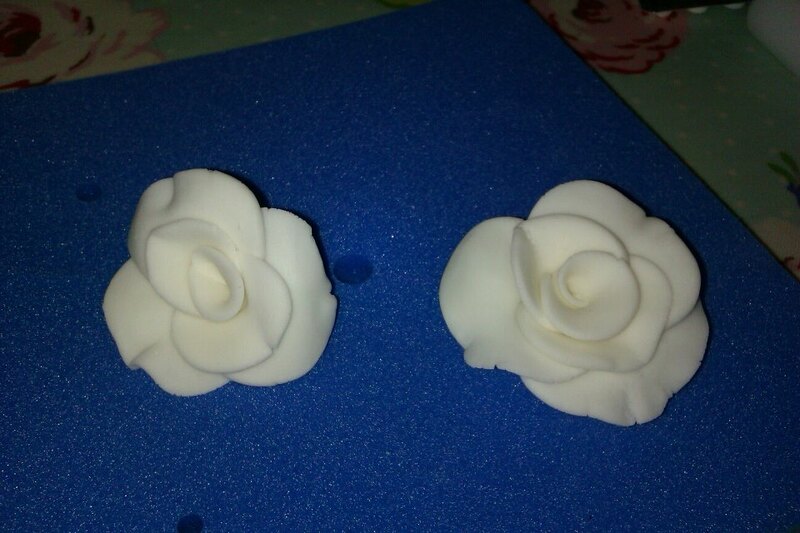 I offered to make some cupcakes so I could start to practice my fondant flowers and butteflies. After an expensive shopping session at Amazon I now own most bits needed to make fondant flowers and other frivolities (and probably a few bits that are totally superfluous) but I couldn't resist! Next I spent some time on Youtube watching videos of different ways of working with fondant, by which time I was raring to go. Well, fondant play work is such fun and totally cathartic. Playdough you can eat, amazing! I made a few mistakes, like fiddling with my butterflies before they had hardened so they broke (I am so bad at waiting for things to be ready!) and trying to pick flowers up by their petals (they are fragile). I had such good fun making the cutest girly flower meadow cupcakes and fairytale toadstool cupcakes and every one said they looked good so I wasn't totally biased! As well as trying out fondant on cucpakes I also had to find a new cupcake recipe. Fondant is heavier that buttercream which means a light sponge will sink so I needed a firmer cake which was weirdly lacking from all the internet search engines I tried. In the end I went for a vanilla version of my chocolate butter cake which worked well, topped with vanilla buttercream to level the cake out, then topped with a circle of fondant. To practice my royal icing piping work I used 'Just Add Water' royal icing mix from Silver Spoon which was. It very easy to mix and no raw egg whites. I made some butter cookies and piped different patterns and words using a PME 1.5 plain piping nozzle in a disposable piping bag. It's a bit like doing handwriting practice when I was at school. My first attempts were not too bad and the words were definitely legible which was a bonus! I have along way to go and as the first wedding is in February I need to get my skates on! Things I have learnt about working with fondant. It is worth investing in a non stick rolling pin for fondant. Rolling fondant out on a sheet of parchment paper will stop the fondant sticking and reduce the need to use icing sugar which can streak coloured fondant. Cover any fondant you are not using in cling film as it sets quickly. Leave fondant figures over night to dry. Do not fiddle until they have been left over night and, once hardened, fondant figures/flowers etc are very fragile. Pick them up using a palette knife, not by their wings/leaves. Flower paste is a pain in the bum to work with but does give delicate leaves for flowers. When topping a cupcake with fondant, cut the disc slightly larger than the cake to allow for doming over the cake. Store fondant flowers and figures in a cardboard box. Fondant needs to breathe and if put in an airtight contain it will become sticky. Vanilla butter sponge cake makes 12 cupcakes. Pre heat oven 170c. Line a 12 hole cupcake tin with cupcake cases. Place the butter and vanilla in a bowl and beat in the electric mixer until light and fluffy. Gradually add the sugar, beating well until creamy. Add the eggs one at a time, beating well after each addition and then add a tbsp of the flour if the mixture looks like it will curdle..
Sift together flour and baking powder. Alternately fold the flour mixture and the milk into the butter mixture. Spoon the mixture into prepared tins and bake for 18 minutes until well risen and a cake testing skewer comes out clean. Leave to cool then top with buttercream to even out the surface. Top with a disc of fondant and decorate to your hearts content. The recipe for buttercream and butter biscuits are detailed in previous blog posts. Ah Thanks. Next practice run is a birthday cake for my sis and niece then Christmas cakes! I am a 40 something, luxury cake decorator living in rural north Herefordshire. I am fully insured and EHO certified. I also follow a low fodmap diet including gluten and lactose free foods.